In March 2010, musician, songwriter and producer Mark Linkous took his own life, leaving behind questions and few answers. For all accounts, he was a person who struggled with substance abuse, depression and physical pain. He also created beautiful, strange and evocative music, exploring his own personal mythologies and dreamlike reflections on the world. 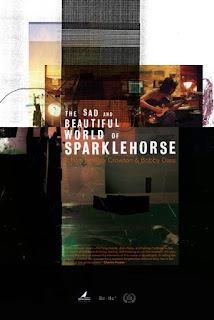 The Strange and Beautiful World of Sparklehorse, a documentary on Linkous' life and music by filmmakers Alex Crowton and Bobby Dass provides a good introduction to Linkous for those unfamiliar with him. Those who know his music will find a lot of familiar ground. As someone who's a huge fan of Linkous and Sparklehorse, I wanted a bit more from this documentary. The poetic narration by singer/songwriter and friend, Angela Faye Martin, takes some adjusting to initially but definitely sets the tone. This is much more an impressionistic take on Linkous' life and music than a straight biopic. Sparklehorse's music is played over dreamy images of wooded areas or cityscapes. There are short clips of music videos (or film that resembles music video). Sparklehorse didn't perform many shows (Linkous didn't like performing) and as someone who was notoriously reserved, he didn't give a lot of interviews. In this documentary, most of Linkous' own insights seem to be taken from a single interview. Instead, filmmakers rely on many of Linkous' friends and fellow musicians to provide details – from Jonathan Donahue to Gemma Hayes – although some of his more well-known collaborators – Wayne Coyne of The Flaming Lips, Nina Perrson of A Camp and The Cardigans – aren't featured here. I'm sure much of that was more just scheduling than oversight, but I wanted to hear from more who knew him. Sparklehorse's music does take center stage – the documentary rightfully focuses on that than Linkous' life. After a short glimpse of Linkous' former band, Dancing Hoods, it skips straight to his time with Sparklehorse, outlining the creation of the band's five albums. Still, due to the nature of this subject matter, it doesn't get too deep into the nitty-gritty of recording or producing. Fair enough that there are going to be gaps, but much of it feels like a primer rather than an insightful look at the creation of music. I wanted to see a more human side to Linkous. Due to his reserved nature, he was always a bit of a mystery, in a capital-R Romantic kind of way. His family were coal miners and he even worked as chimney sweep. Even the overdose that left him in a wheelchair for a while added to his dark allure. And as much as all of that is part of Linkous' appeal as a musician, it feels like well-tread territory when it comes to discussing him. I wanted more moments of Martin talking about his excitement over working with David Lynch, or more of David Lowery reminiscing about when Linkous was one of the first ones to visit when his son was born. Instead, there is too much talk of the “darkness” that Linkous had inside him. I understand that's true, but he's left as much more of an enigma than a real person. But maybe that's just how any movie about Linkous and Sparklehorse is going to end up. In the end, it's hard to really find fault with this documentary. It's well-intentioned and well-meant, and for all its flaws, I did watch it twice. 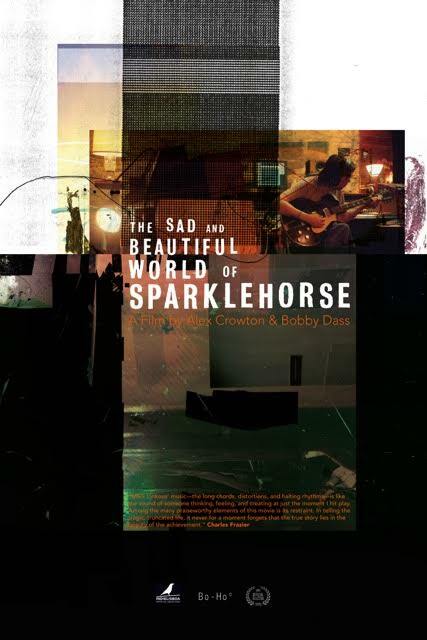 I have no doubt Crowton and Dass just wanted to share their love of Sparklehorse with the world. I appreciate that they did.